what is it about the denim jacket? 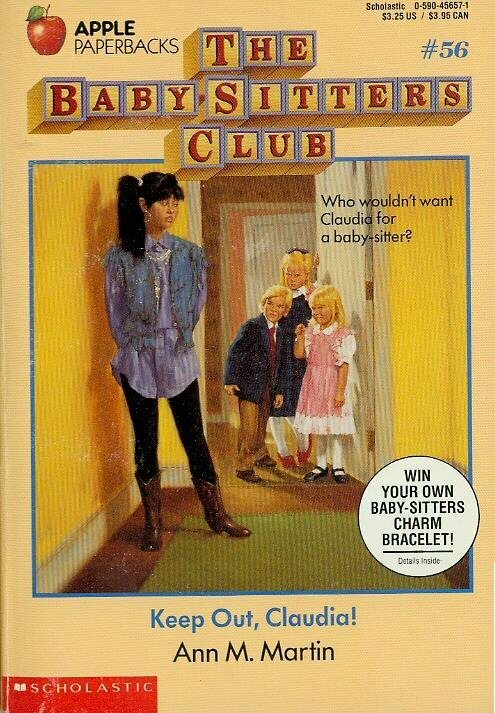 my obsession with it goes all the way back to...The Babysitters Club. a part of me always wants to style it like Claudia would. actually, this is pretty much what i would wear right now anyway. leggings? check. slouchy shirt layered under denim jacket? check. statement jewelry? check. boots? yeah..
the classic version for me is a light wash with some slight fading, slim-fitted, and 100% cotton denim, no-stretch-thank-you-very-much. it's the perfect transitional-weather jacket for the brisk morning and evening temps. the wash looks a lot more dramatic on madewell's website for some reason; in person it looks nicer and more subtly faded. do you have a denim jacket? how do you like to wear it? ahah! that sounds really rad - what did you do with your jacket? you still have it i hope? Claudia was always my favourite member of the BSC! Unfortunately I don't own a denim jacket though! I always waffle back and forth on them because they're not really my style but they are such staple wardrobe pieces! seriously Claudia is such a style trailblazer. 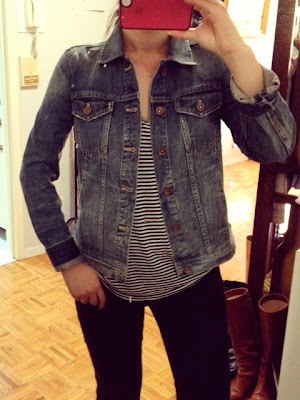 my denim jacket is perfect for this pre-leather jacket weather we're having! I like how they look on others (including you!) but I just gave away my one and only denim jacket from GAP to my sister that I had for years and years and maybe wore twice. I don't find them very comfortable, even with stretch. And I'm totally for denim on denim in differing shades but for whatever reason, when I did want to wear my jean jacket it always seemed to be with like-colored jeans ... the denim tuxedo is not a good look on me, ha. I love that you mentioned the babysitters club! I was obsessed with that series. I always thought Claudia's sense of style was so "funky" and "cool," but never thought her style worked for me. I loved how sophisticated Stacey sounded (being from NY and all), but I knew inside I was a Dawn (California girl).yes I thought this deeply into the characters and wanted to emulate them. anyways, I wore denim jackets all my younger life (gap as a kid and abercrombie as a teen), but for the past several years I haven't worn one. I haven't found one that fits right and I feel a bit contained in a denim jacket. I love how the madewell looks on you. is the denim really heavy? thanks Caroline! the denim is actually a nice, lighter side of midweight cotton denim. fits really nicely, though it does run a smidge small (i'm wearing the Small and there's some room to layer underneath). i really love that it's 100% cotton denim and not some stretchy denim blend. drapes and creases and holds structure just right. this and the chambray shirt are definitely Madewell's best items. Ive got the denim jacket (classic levis) and love it. What i want now is claudia's cowboy boots! it's spring here in Australia and my denim jacket has been getting a lot of love, especially now that it's a bit too warm for my wool and leather jackets. my dad gave me my jacket, he had it as a teenager in the late 60's. It fits pretty well, I cuff the sleeves and go for it. I've recently added some badges to it, mainly so I don't lose the badges, but they look sweet. (PS I always figured I dressed like a cross between Mary-Anne's girliness and Claudia's craziness). your jacket sounds like such a special piece - i'm also kind of intrigued by badges and patches on vintage jackets. such a cool way to express the history of a well-loved wardrobe piece! I have 2 denim jackets, one is a grey RL Polo jeans one that is over a decade old--and still looks brand new. Another is a blue bomber style one from DKNY Jeans that is 8+ years old. The traditional denim jackets have that back-to-school vibe don't they? Your Madewell one is very nice, and funny enough is does look pretty well made. I have two. A dark wash and a a lighter faded wash. I consider my dark wash one more for dressing up and the light wash for dressing down. But really I like just having the options. Dark one is from Old Navy the light one is from The Gap. Found the light wash at a thrift store for $4.99! Claudia was always my fave too! I love the look of denim jackets, but I can never find one that fits right. They're always too big in the shoulders or too short or have a weird color or don't button nicely. I like the wash of Madewell jacket you got and tried it on in the store a few months ago, but it also just didn't work for me.